For anyone who is used only to travelling in European wine regions, a visit to the winelands of South Africa is simply a revelation. Increasingly the country offers an example to other wine producing wine countries as to how comprehensive and varied, and frankly downright welcoming and unforgettable, the wine travel experience can be. Whereas there are compact areas to tour like Constantia, Swartland, Robertson or Hermanus that can be covered in a day or two, the offering from the larger Stellenbosch and Paarl regions is simply so huge that it is seriously hard to choose which of the many wineries to visit. On our wine tour of South Africa last January, part press trip and partly on our own, a couple of wine tourism offerings really stood out for their originality. Warwick Estate is one of the many Stellenbosch wine farms that lies in a drop dead gorgeous location, surrounded by its vineyards with views to the dramatic mountains of the Western Cape. Owned by the Ratcliffe family since 1964, the farm was named Warwick by a previous owner of the estate who had been a general of the Warwickshire Regiment in the Anglo-Boer War. 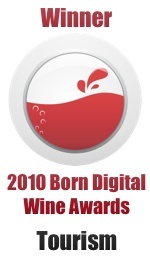 The farm has a red wine focus with its two most famous wines being blends: the highly acclaimed Trilogy, a blend of Cabernet Sauvignon, Cabernet Franc and Merlot, made in Bordeaux style to age; and the more approachable Three Cape Ladies from Cabernet Sauvignon and Pinotage with a splash of Merlot and Syrah, depending on the year. Cabernet Sauvignon is the king of red grapes and the lion is the king of the jungle, like a young lion fighting for dominance in the pride Cabernet Sauvignon is aggressive when young but softens with age. Like an elephant Cabernet Franc has a very thick skin. Elephants love to wallow in mud and Cabernet Franc has a very earthy flavour profile. Single variety Cabernet Francs are very rare so when you try one you always remember it, the elephant also has a very good memory. Merlot is a very shy and elusive grape just like the leopard. Merlot is very difficult to spot in a blend, and the leopard is the hardest of the big 5 to spot. The Rhino is the easiest animal to identify in the wild because of its distinctive nose, Sauvignon Blanc is the easiest grape variety to indentify blind also because of its nose. Rhino horn is also an aphrodisiac but Professor Black Sauvignon Blanc is a better and more environmentally friendly aphrodisiac. The buffalo is a very aggressive and unpredictable animal; Pinotage is also unpredictable and has very aggressive tannins. Keeping on the animal theme, just up the road into the Paarl wine district, not far from the town of Paarl, is Fairview Winery. It is known for a big range of wines from in particular Rhône Valley grape varieties, and also for its goats’ cheese produced from a herd of 800 goats, a few of which you will see enjoying its quirky goat tower! Fairview is owned by the highly respected Back family, who have farmed here since 1937, with their first Fairview wine label in 1974 and a cheese factory created in 1985. Fairview welcomes 200,000 visitors to their tasting room every year, and like their wine range it has expanded greatly since I first visited this lovely winery and cheesemaker in 1998. Although you cannot do a cellar tour here, the choice of tastings available is very good, with education being the key. The main Fairview tasting room today has wooden pods with well trained staff to take you through six selected wines, with cheeses being available at separate pods – a more expensive, but still excellent value option allows you to enjoy a sit-down tutored tasting in a dedicated, more formal room next door. The whole atmosphere is both buzzing and relaxed, and the range of wines remains as it has always been, innovative and good quality at every price level from the Goats do Roam range with its amusing labels and stories, to the interesting Spice Route range and the most serious Single Vineyard Fairview labels such as my favourite Beacon Shiraz. The on-site Goatshed restaurant continues the relaxed feel offering a casual bistro atmosphere for daytime snacks or lunch. There is an emphasis on fresh Mediterranean-style food, with plenty of bright-coloured vegetables, great bread and of course, a chance to sample the goats’ cheeses once again. Some of South Africa’s finest restaurants are in the wine regions, and the quality of meals we were able to enjoy in the more serious winery restaurants in South Africa’s winelands was astoundingly good. 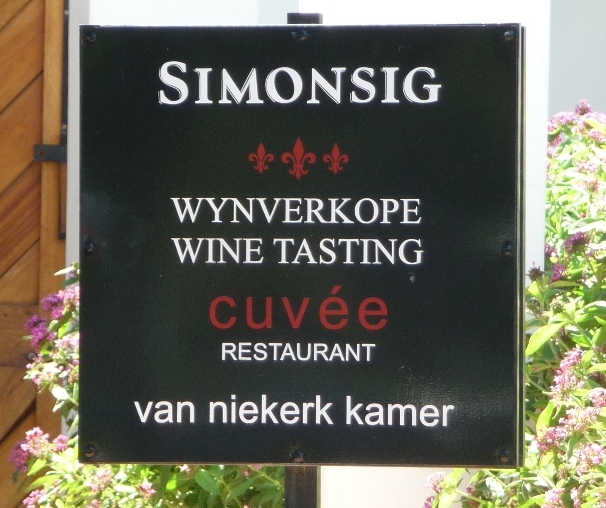 We were lucky enough to sample excellent meals at the Cuvée Restaurant of Simonsig, the Bodega Restaurant of Dornier, Terroir Restaurant at Kleine Zalze and the Jordan Wines Restaurant, all in Stellenbosch, as well as at La Motte in Franschhoek. At all these restaurants you can enjoy wines by the glass or by the bottle, with very good food. Each restaurant was enjoyable and impressive in a different way, but all were constructed to make the most of the local architectural heritage and the landscape, with views from the terraces and large windows, and with menus concocted to make the best of the wines. Most of all, for those who enjoy fine food and wine, I think that any of these could be indulged in for a really special dressed-up occasion, or simply on a much more relaxed holiday visit, perhaps after visiting some of their excellent tasting rooms. For more information about visiting South Africa’s winelands, start your research with the Stellenbosch Wine Routes and the Franschhoek Wine Valley websites. My thanks go to the wine producers and restaurants who kindly hosted us. Our trip was partly with a group from the Circle of Wine Writers and was part-sponsored by Wines of South Africa. This entry was posted on Thursday, October 27th, 2011 at 9:19 am and is filed under Places to Stay, Eat and Shop, Vineyard Visits. You can follow any responses to this entry through the RSS 2.0 feed. Both comments and pings are currently closed.